1. Preheat oven to 400°. Cook orzo according to package directions in salted water; drain. Return to pot. Add arugula, feta, oil, and 1/4 teaspoon each salt and freshly ground black pepper; stir. 2. Season inside of peppers with 1/4 teaspoon each salt and pepper. Fill peppers; transfer to a 9- x 13-inch baking dish. 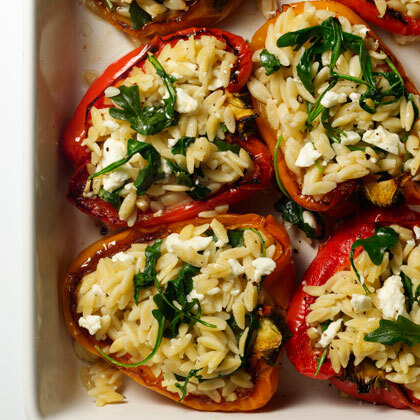 Cover with foil; bake until peppers are tender (35-40 minutes).